Harald Gangl reduziert in dem Maße, in dem die Fülle seiner Bildsprache zunimmt – je mehr er sich abverlangt, je tiefer er in die Farbtöne eintritt, um so reicher ist das Ergebnis – reich an gedanklicher Fülle, aber auch reich an ertastbarem und fühlbarem Material. Wenn wir uns nun nach langer Zeit von dem Bild abgewandt haben, bleibt mehr ein Geschmack und ein Klang in uns zurück, als eine bildliche Vorstellung. Wir haben, ohne es zu merken, mit dem Bild gesprochen, es hat uns in eine wortreiche Unterredung verwickelt, einmal ganz laut, dann wieder ganz leise. Und wir haben, ohne es erkannt zu haben, einen Ausschnitt der Welt gesehen: Wir haben unterschieden zwischen Himmel und Erde, haben einen Schneesturm gesehen die Oberfläche einer Lacke oder die weite Landschaft Afrikas, das Flimmern über der Wüste oder den Sprühregen eines Wasserfalls im fernöstlichen China. Auf jeden Fall ist es eine ganze Menge, auf jeden Fall viel zu viel, um es mit dem losen Wort „Abstraktion“ abzutun – und wenn wir nur sagen können, es ist „schön“, so sei uns das zugestanden, denn um die ganze Fülle der Erlebniswelt auszudrücken, die wir durchlebt haben, fehlen uns die Worte. Are they underwater photos? Diffuse cloud formations? Or snow flurries? Colour effects or miniature photographs? Paint palette residues? Traces of fire? Mere light reflections? Cosmic events? Extreme blow-ups of miniscule objects? The emergence of “abstract” painting, be it Informalism, Tachism or action painting, not only liberated pictures from any representational function but also made it possible to regard works from a non‑representational point of view. With the figurative element removed, the picture becomes an intrinsic and extrinsic membrane. Modern literature coined the term “stream of consciousness”, an internal monologue that only becomes visible and meaningful to the reader through the verbal streams. James Joyce’s novel Ulysses is a classic example. Informal painting uses the same procedure. We can describe Harald Gangl’s painting style as an “internal monologue”, in which he uses paint rather than words to “speak” or “write”. His informal painting – which is only partially in the form of classical gestural art – is a complex and gradual process. The self-spanned Molino canvas, which has to be stretched very tightly for his painting process, is pre-coated and primed with white chalk, but Fabriani paper is also an important backing material, providing the basis for the paint and colour to be built up on it. Layers of paint are applied intuitively with brush, hands or palette knife, then repeatedly scraped or scratched off and reapplied. The traces of paint create finely nuanced elements of colour and transitions that merge shapelessly with one another. Just as the words flow together in an “internal monologue” – often without a discernible syntax – Gangl’s colours merge with one another to form characteristic colour textures. He endeavours to create not a conceptual but an atmospheric picture. His “rhetoric” of colours forms a vibrant surface image, and the meticulous layered architecture of his spontaneous filigree method of painting also produces an extremely inspiring pictorial space. Recent works contain even finer glazed layers, fragile-seeming colour elements that further accentuate the spatial effect. Abstract and non-figurative painting offers few instruments for pictorial representation. Colour, quasi-organic shapes and light are the basic ingredients out of which the pictorial cosmos is created. 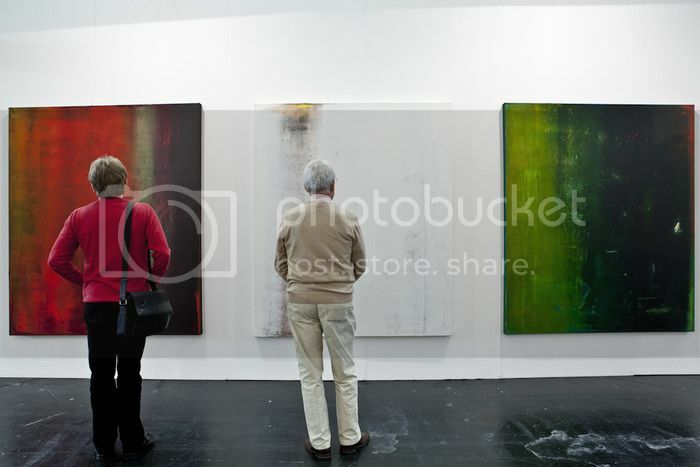 Momentary sensations are the driving force behind the painting. The resultant “pictorial moods” evoke endless interior worlds. In Gangl’s work, worlds of light emerge from the painted surfaces; in fact it is the creation of light from colour that gives his paintings their basic tone. The transparency of the pictures produces a dematerialising colour effect. In the artist’s work, light as the origin of all life takes on a “Gothic” dimension, transcending the material, mutating the colours themselves into light worlds, endless spiritual expanses, an infinite sensory cosmos. The amalgamation of light and colour gives form to the subtle paint textures of the works – their sound spheres, metaphorically speaking – and requires viewers to adapt their way of seeing, to listen to the colours, so to speak, so as to be able to appreciate the sounds. The liberation of seeing from a figurative perception opens up an “inner” vision that is reliant on its own devices: what do I see, when there is seemingly nothing to see? Seeing as an immaterial way of perceiving the world only reveals itself really in a non-figurative or “abstract” picture. The distinction between vision and the eye as two spheres of seeing, as Jacques Lacan describes, demands a special subject constitution as perception. It is no coincidence that the perception of objects not visible to the retina correlates with Freud’s concept of the unconscious, which coincided with the invention of X rays, the theory of relativity and the emergence of “abstract” art forms. Paul Klee’s dictum “art does not reproduce the visible; it makes visible” opens up the way to a new form of imagination beyond an iconic experience of the world. It is no less than a new aesthetic, evoked by the separation of colour from its object, through autonomy in the artistic image-forming process. Light becomes a new pictorial gene: no longer coming from outside but “intrinsic” to the pictorial phenomenon. Harald Gangl’s latest works “relate” this pictorial paradigm to us: that seeing is more than an iconic or psychologising perception of the retinal world. Self-Seer is the title of a work by Egon Schiele – and is it not also about seeing yourself seeing? The absence of an outside world should not be taken as a rejection but as an “informal” extension and expansion of life and a way out of the iconographic jungle into the freedom of pictorial worlds.